(ch) Make a first chain. Then yarn over hook and draw through a loop on the hook to make one chain. (sl.st) Insert the hook into the stitch, yarn over hook and draw through a loop, draw this loop through loop on the hook. When a number of chains have to be joined into a circle, the circle closed with a slip stitch. (sc) Insert the hook into the given stitch, yarn over hook and draw through a loop, (2 loops on hook), yarn over hook and draw through 2 loops on hook (1 loop remains on hook). (d.sc) Insert the hook into the given stitch, yarn over hook and draw through a loop,( 2 loops on hook), yarn over hook, insert the hook into the same stitch, yarn over hook and draw through a loop, (4 loops on hook), yarn over hook and draw through 4 loops (1 loop remains on hook). (tss) 1 row (outward): insert hook into second chain from hook, yarn over hook, draw loop through and leave on hook, * hook into next chain, yarn over hook, draw loop through and leave on hook, repeat from * to end of row. 2 row (return): without turning the work, yarn over hook, draw through a loop, *yarn over hook and draw through 2 loops on hook, repeat from * to end of row. 3 row (outward): 1 turning chain, miss first loop, * insert hook into next loop, yarn over hook, and draw loop through, repeat from * to end of row. (ch.sc) Insert the hook into the stitch, yarn over hook and draw through a loop (2 loops on hook), yarn over hook and draw through a first loop on hook (2 loops on hook), yarn over hook and draw through 2 loops on hook (1 loop remains on hook). (rv.sc) Insert the hook into the second stitch to right of hook, yarn over hook and draw through a loop ( 2 loops on hook), yarn over hook and draw through 2 loops on hook (1 loop remains on hook). (h.dc) Insert hook into stitch, yarn over hook and draw through a loop, (3 loops on hook), yarn over hook and draw through 3 loops on hook (1 loop remains on hook). (dc) Yarn over hook, insert hook into stitch, yarn over hook and draw through a loop (3 loops on hook), yarn over hook and draw through 2 loops on hook, yarn over hook and draw through remaining 2 loops on hook (1 loop remains on hook). (tr) Yarn over hook 2 times, insert hook into stitch, yarn over hook and draw through a loop ( 4 loops on hook), yarn over hook and draw through 2 loops on hook, yarn over hook and draw through next 2 loops on hook, yarn over hook and draw through remaining 2 loops on hook (1 loop remains on hook). 3 treble cluster 3 double crochet cluster Yarn over hook, insert hook into stitch to be worked and draw the yarn, yarn over hook and draw through 2 loops on hook (1 incomplete treble/double crochet), * yarn over hook, insert hook into same stitch and draw the yarn, yarn over hook and draw through 2 loops on hook, repeat from * 1 time, yarn over hook and draw through all loops. 6 treble cluster 6 double crochet cluster Work 6 incomplete treble/double crochet in the same stitch then yarn over hook and draw through all loops. 2 double treble cluster 2 treble cluster Work 2 incomplete double treble/treble in the same stitch, then yarn over hook and draw through all loops. 3 double treble cluster 3 treble cluster Work 3 incomplete double treble/treble in the same stitch, then yarn over hook and draw through all loops. 5 treble popcorn 5 double crochet popcorn Work one chain and 5 treble/double crochet in the same stitch. Take the final loop of the last stitch worked from the hook and insert the hook into the one chain before the group of stitches, then into the dropped loop and draw the yarn through. 7 treble popcorn 7 double crochet popcorn Work one chain and 7 treble/double crochet in the same stitch. Take the final loop of the last stitch worked from the hook and insert the hook into the one chain before the group of stitches, then into the dropped loop and draw the yarn through. 4 half treble puff stitch 4 half double crochet puff stitch Yarn over hook, insert hook into stitch to be worked and draw yarn up 0,5 - 1 cm, *yarn over hook, insert hook into same stitch and draw yarn up, repeat from*3 times, yarn over hook and draw through all loops. 6 half treble puff stitch 6 half double crochet puff stitch Yarn over hook, insert hook into stitch to be worked and draw yarn up 0,5 – 1 cm, *yarn over hook, insert hook into same stitch and draw yarn up, repeat from*5 times, yarn over hook and draw through all loops. bullion stitch bullion stitch Yarn over hook the required number of times, usually from 10 to 12 times, hook insert into stitch, yarn over hook and draw loop through, yarn over hook and draw through all loops on hook, finish by working a chain. Flower from puffs or clusters Flower from puffs or clusters 1 row: work 1 treble / double crochet in space of 3 chains below, 3 chains, 1 incomplete cluster in third chain to right of hook, 1 incomplete cluster in space of 3 chains below and 1 incomplete cluster in next space of 3 chains below, yarn over hook and draw through all loops (3 clusters decrease). Then work 3 chains, 1 cluster in third chain to right of hook and 1 treble / double crochet in space of 3 chains below. 2 row: 1 treble / double crochet in stitch below, 3 chains, * 1 cluster in top of 3 clusters decrease below, 3 chains, repeat from * 1 time, 1 treble / double crochet in stitch below. picot of 3 chains closed with a slip stitch to the previous stitch picot of 3 chain stitches closed with a slip stitch to the previous stitch Work 3 chain/chain stitches. The final chain is joined to the work by working a slip stitch into a previous stitch to right of hook. picot of 5 chains closed with a slip stitch to the previous stitch picot of 5 chain stitches closed with a slip stitch to the previous stitch Work 5 chain/chain stitches. The final chain is joined to the work by working a slip stitch into a previous stitch to right of hook. picot of 5 chains closed with a slip stitch to the 5th chain picot of 5 chains closed with a slip stitch to the 5th chain Work 5 chain/chain stitches. The final chain is joined to the work by working a slip stitch into the first chain. picot of 5 chains closed with a double crochet to the 5th chain picot of 5 chain stitches closed with a single crochet to the 5th chain Work 5 chain/chain stitches. The final chain is joined to the work by working a double crochet / single crochet into the first chain. crossed treble stitch 1x1 cross double crochet stitch 1x1 One method is to miss a stitch, work the given stitch in the next stitch and then the given stitch in the missed stitch. Another method makes a crossed stitch which is separate from its pair. Miss 1 stitch, work the given stitch in the next stitch and with the hook behind the stitch just worked, insert it into the missed stitch and work the given stitch. These are worked on the longer crochet stitches without actually crossing them. Using a double treble / treble stitch, yarn over hook twice and insert hook into stitch, yarn over hook and draw through a loop, yarn over hook and draw through 2 loops ( 3 loops on hook), yarn over hook and insert hook into given stitch, yarn over hook and draw through a loop, yarn over hook and draw through 2 loops (two “legs” made), * yarn over hook and draw through 2 loops, repeat from* 3 times. Work number of chains required to begin to work the second arm. Yarn over hook, insert hook into center of previous stitch draw through a loop, * yarn over hook and draw through 2 loops, repeat from* 2 times. 1 half cross double treble 1 half cross treble Yarn over hook twice and insert hook into stitch, yarn over hook and draw through a loop, yarn over hook and draw through 2 loops ( 1 incomplete treble / double crochet ), yarn over hook and insert hook into given stitch, yarn over hook and draw through a loop, yarn over hook and draw through 2 loops (1 incomplete treble / double crochet) - two “legs” made, * yarn over hook and draw through 2 loops, repeat from* 3 times. 1 half cross quintuple treble 1 half cross quadruple treble Yarn over hook five times and insert hook into stitch, work 1 incomplete double treble / treble, yarn over twice, insert hook in next stitch and work 1 incomplete double treble / treble, * yarn over hook and draw through 2 loops, repeat from* 5 times (1 loop remains on hook). 2 double crochet stitches worked in a single stitch 2 single crochet stitches worked in a single stitch These are stitches working in the same stitch of previous row/round. 2 treble stitches separated by 2 or 3 chains, worked in a single stitch 2 double crochet stitches separated by 2 or 3 chain stitches worked in a single stitch These are stitches working in the same stitch of previous row/round and separated by the chain/chain stitch. 2 double crochet stitches decrease 2 single crochet stitches decrease Work the given incomplete stitches then draw yarn through all loops on hook. 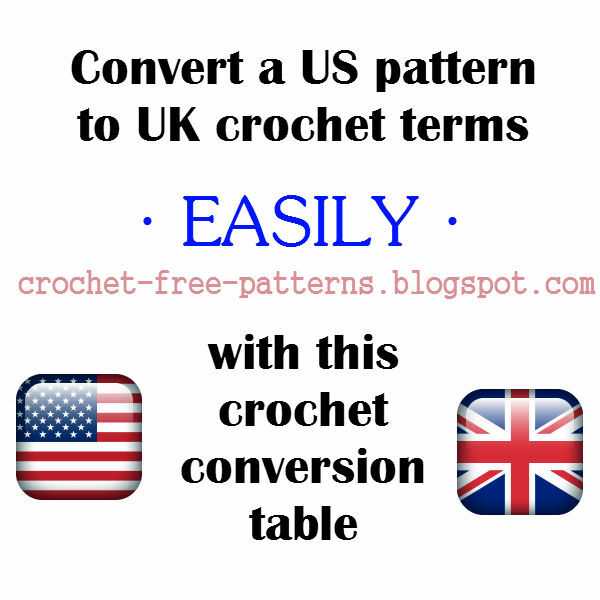 For example, 2 treble stitch decrease / 2 double crochet decrease. Yarn over hook, insert hook into stitch, yarn over hook and draw through a loop, ( 3 loops on hook), yarn over hook and draw through 2 loops on hook, yarn over hook and insert hook into next stitch, yarn over hook and draw through a loop, ( 4 loops on hook), yarn over hook and draw through 2 loops on hook, ( 3 loops on hook), yarn over hook and draw through remaining 3 loops on hook (1 loop remains on hook). 5 long half treble stitches decrease 5 long half double crochet stitches decrease Or for example, 6 long half treble stitches decrease / 6 half double crochet decrease. Yarn over hook, insert hook into stitch to be worked and draw yarn up 1 cm, *yarn over hook, insert hook into next stitch and draw yarn up, repeat 5 from* times, yarn over hook and draw through all loops. relief double crochet worked at front relief single crochet worked at front These are worked by taking the hook round the stem of a stitch. A relief front stitches is made by wrapping the yarn over the hook, taking the hook from the front and from the right to left round the stitch to be worked and then completing the stitch normally. A relief back stitches is made by wrapping the yarn over the hook, taking the hook from the back and from the right to left round the stitch to be worked and then completing the stitch normally. double crochet worked in back loop of chain stitch single crochet worked in back loop of chain stitch This crochet technique is used for relief work. Insert the hook into back or front chain stitch of previous row and work given stitch. ring of yarn ring of yarn Loop the yarn around knitting needle a few times and then make one stitch to connect them. Then work a given stitches into circle. Join the last stitch to the first stitch by a slip stitch. ring of 1 chain ring of 1 chain stitch Work turning chains and one chain / chain stitch. Insert hook into last chain from hook and work a given stitches. Join the last stitch to the turning chain by a slip stitch. working circularly like spiral working circularly like spiral In work does not join rounds, working without turning chains, the last stitch work in firs stitch. the first red chain is the beginning of the foundation chain the first red chain stitch is the beginning of the foundation chain Making a first chain: first make a slip loop. Take hold of the crochet hook in the right hand and insert it through the loop. Draw the loop through and leaving the hook in the yarn, pull the short end to close the loop round the hook. the number of row/rounds the number of row/rounds Crochet can be worked in rows or rounds. When working in rows the work is turned, as in knitting, to start a new row. Many patterns, such as hats, begs, socks or baby booties, are worked circularly (or in rounds). In work the last stitch of each round is connected to the first stitch with a slip stitch. these symbols indicate the amount of chain stitches of arch these symbols indicate the amount of chain stitches of arch When working with arch of chains / chain stitches in many patterns crochet hook, usually, insert into space below. Thus, a stitches engulfs a chain stitch from every quarter. spikes, these symbols indicate in what row or round work given stitch spikes, these symbols indicate in what row or round work given stitch These are made by inserting the hook below the row previously worked. A loop is draw through and up to the height of the current row and the stitch is then finished normally. this arrow is shows where motifs to connect with one another this arrow is shows where motifs to connect with one another The motifs to connect with one another by slip stitch or double crochet/single crochet.